A prominent republican has been threatened with a €15m fine and/or 10 years in prison for the discharge of poisonous diesel-laundering waste into a public water supply in the Republic, the Sunday Independent can reveal. It is believed to be the first time that the penalties, under the 1996 Waste Management Act, have been threatened against one of the fuel launderers who have dumped thousands of tons of highly toxic waste in the Border area. The summons, initially issued in April, allowed for 30 days in which the man - who is worth millions and runs a number of fuel outlets and other businesses - could rectify the pollution damage to the satisfaction of the local authority, in this case Monaghan District Council, overseen by the Environmental Protection Agency (EPA). This deadline passed and it is understood the man has denied any culpability and is refusing to carry out the work. The summons, issued by the State Solicitor's office, cited Section (1) (B) of the Waste Management Act, which carries the fine of up to €15m and/or up to 10 years' imprisonment. Under the terms of the summons, the subject has to complete the work to the EPA's satisfaction or have the work carried out by the council and the cost added to any other punishment. It is understood the man has transferred a substantial amount of his wealth to a close relative. Garda sources say the man is suspected of having up to €7m stashed away in offshore accounts, as well as a massive property portfolio of up to 70 business and residential rented properties. The sources say the man's money and property, although in his name or the name or a relative, is effectively controlled by the Provisional IRA. The diesel plant under investigation is one of dozens in the south Armagh and the Border areas of Louth and Monaghan that have produced thousands of tons of toxic waste over the past two decades, and cost both the British and Irish Exchequers hundreds of millions in lost revenue. Despite the enormity of the operations controlled by the IRA, and dozens of seizures of plants and diesel, as well as the toxic waste, no one, north or south of the Border, has been imprisoned for the offences of polluting drinking water supplies. This includes the main reservoir supplying the Crossmaglen area from Lough Ross, and the supplies to Dundalk and other parts of north Louth from the Fane river. This has led to the belief locally that the diesel smugglers are immune from prosecution under a secret deal struck with the Provisional IRA, under which it was allowed to continue its 'fund-raising' activities so long as it maintains its 'ceasefire'. The plant that is the subject of the EPA summons is close to the Border in Co Monaghan. Discharge from the plant has been running into the Fane system for more than a decade. 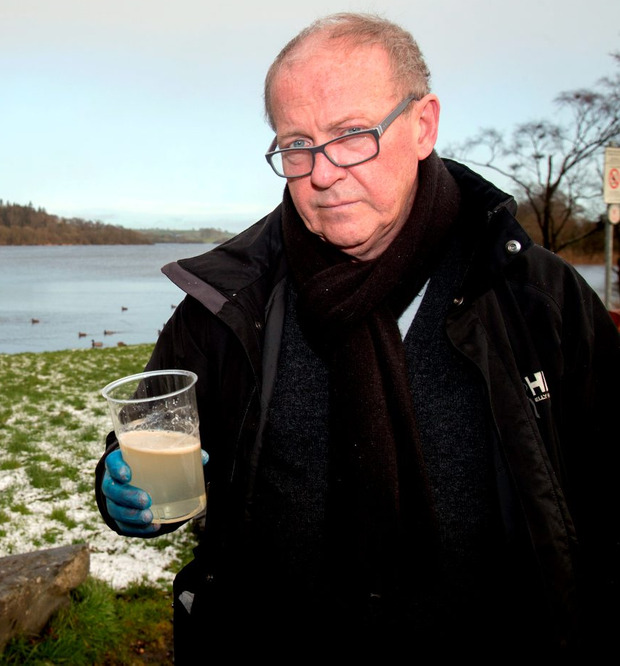 Samples of polluted stream water, taken for analysis by the Sunday Independent in January last year, found that the water was many times over EU limits, not only for drinking water but also for industrial-waste discharge. The EPA visited a number of sites in the Border area and took samples over last year. A number of these tests are understood to have led to the issuing of the summons to the plant operator. The man is not thought to have ever been an 'active' member of the IRA during the Troubles in the North but became close to the south Armagh leadership and often appears at Sinn Fein events. He is a close associate of the IRA's south Armagh godfather, Thomas 'Slab' Murphy, who is still serving an 18-month jail term for tax evasion, imposed in February by the Special Criminal Court - the first time the anti-terrorist court heard a tax case. After the Kinahan drugs cartel, the IRA's fuel and tobacco-smuggling operations, controlled by the south Armagh 'brigade', is regarded as the biggest organised criminal operation on the island. Locals believe one of the reasons that so few prosecutions have taken place is because the British government has allowed the illicit operations to continue to preserve the IRA ceasefire. It is also believed that a number of prominent figures involved in the smuggling are also agents for the British security forces. Despite both governments insisting there was no deal done with the Provisional IRA over the ending of its terrorist campaign, there was no significant action taken against any of the main fuel launderers or smugglers in the Border area. This is despite the fact that, year after year, local councils spend millions of taxpayers' money on cleaning up the environmental damage done by the dumping of huge amounts of cancer-causing polycyclic hydrocarbons. Gareth Morgan CARMEL Collins, the mother of innocent gang victim Roy Collins, has died. Michael McHugh A MAN has been arrested following security alerts in Derry on Sunday morning.